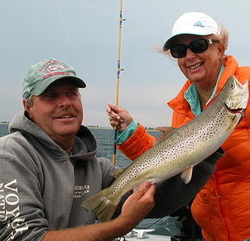 D's S﻿uperior Fishing Charters is a great way to enjoy the spectacular scenic beauty of Lake Superior's Apostle Islands/Chequamegon Bay area while fishing for lake trout, brown trout, steelhead, coho, and chinook salmon. Each trip is tailored especially for your group's enjoyment. We offer reasonable rates, flexible scheduling, and we go where the fishing is best. Organize your crew of 1 to 6 fishing buddies, catch some fish and enjoy beautiful Lake Superior. Children are especially welcome. there in the Chequamegon Bay area. Jamie M.
Absolutely the best charter we have ever had. Darryl knows his stuff when it comes to fishing. Other charters only let you touch the pole once there's a fish on, but not with Darryl. He lets you do all the work. Every trip has been awesome! 100% recommend!! Cindy G.